Restaurants listed in order of personal preference under each sub-category. Pros: Mini portions, great for a group to share multiple dishes or if you're a hungry guy who likes bite-sized eggs benedict all to himself. Cons: If you're a hungry guy who doesn't like to share. Pros: There's plenty of natural light pouring in through the floor to ceiling windows. The restaurant itself is spacious, making it ideal if you need to make reservations for a big group. Recommended dishes include the Trio of Oysters, Spicy Kalbi Short Ribs, Skyve Beef Tartare, and the Mango & Cheese Semifreddo. Pros: Beautiful settings amongst the greenery and nature at the quiet Bukit Timah Saddle Club. Watch the horses gallop in the grassy fields around the stables from your seat. Cons: Very inconvenient to reach unless take a taxi, have your own car or maybe own your own horse. Pros: American fare, American portions, NYC West Village quality. Breakfast/brunch served everyday (until 11am on weekdays, 2:30pm on weekends). Cons: A pretty compact place, so you'll probably want to call ahead to make sure there's seating available. Bacchanalia Brunch Series Update: Bacchanalia is now a Michelin-starred restaurant, and no longer runs this brunch series. Pros: Starting as a pop-up champagne brunch series, Bacchanalia has evolved into a full scale restaurant and cocktail bar. Bacchanalia has set the trend for chic Saturday brunching, recreating the weekend atmosphere you would find in New York City and London. With Chef Ivan Brehm (formally from The Fat Duck and Per Se) helming the kitchen, you'll find innovative touches on familiar brunch favorites. But at 2:30pm as diners begin to polish off their plates, the lights begin to dim and the DJ cranks up the music. Socialites and young professionals break out the Moët, Dom Perignon and Belvedere bottles and party until sunset. Cons: Usually a chance of champagne showers. Don't let your Birkin get wet. Address: 23A Coleman Street. Check Bacchanalia Facebook Page or e-mail brunch@bacchanalia.asia for more information. Pros: For SG$170++ you get a main course, endless access to the elegant antipasto, seafood and dessert counters, and free flow Perrier-Jouet Grand Brut, Bloody Mary and juices. Cons: This is the anti-Bacchanalia brunch. The crowd tends to be more mature and the price reflects the atmosphere (ie. if the socialite tai-tai scene isn't your thing, you might feel uncomfortable here). Pros: Ritz-Carlton's Sunday Vintage Brunch at Greenhouse is nothing short of decadent. (SG$168 – 2002 Vintage Moët & Chandon champagne, wine and selected cocktails $84 – kids aged 6 to 12 $42 – kids aged 3 to 5). Twice a year, Ritz-Carlton also holds the SuperBrunch, featuring an endless buffet table, spannin across the entirety of the first floor by special guest chefs. Pros: There's a reason I wrote a glowing review about Cassia last year. The interior design by Hong Kong designer, Andre Fu, is beautiful and I say without hesitation, the service is phenomenal. Attentive, patient, helpful, warm, gentle and all around professional. Cons: Transportation is a problem without your own car or taxi. There have been reports on dim sum quality being somewhat inconsistent - I admittedly have only had their dim sum once, so cannot confirm (I've dined there numerous times for dinner). Toby's Estate is a specialty coffee roaster from Australia. They opened their doors in Singapore in 2011, serving cafe bites and their in-house roasted coffee. The bircher muesli is addictive. And the coffee is pretty swell too. Pros: Quality spread, especially if you love Sunday roast and Yorkshire pudding -- award-winning Chef de Cuisine Lee Bennett hails from Yorkshire, after all. The crêpe Suzette here is also one of the best I've had in Singapore (Le Saint Julien makes my favorite crêpe Suzette, but that's for another post). The excellent panoramic view from the floor-to-ceiling windows over Singapore's Marina Bay is also hard to beat. Cons: The offerings aren't as wide or varied, as say, Shangri La Singapore's brunch buffet spread. Also be sure to make reservations for Sunday brunch well ahead of time... request for a seat by the window while you're at it. Pros: Is there anything The Line buffet doesn't have? Indian, Japanese, Western, Chinese, dim sum, seafood, roasts, fresh juices, smoothies, desserts -- heck, there is even a candy section with cabinets full of gummy bears and lollipops, and a station for local drinks such as teh tarik. Best yet, buffet is offered every day of the week. Not too shabby for SG50++ (Saturday), SG$78++ (Sunday), SG$47++ (Weekday). Cons: It gets extremely noisy on weekends when families bring their little ones -- try not to trip over them as you waddle back to your table with your piled-up plate. 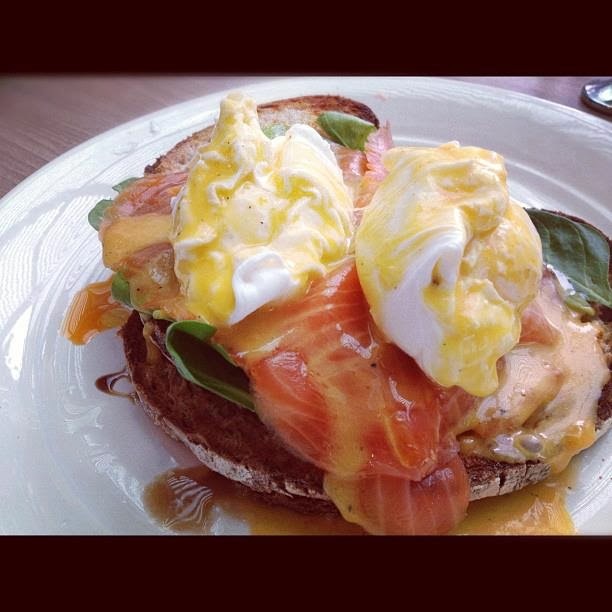 Pros: The smoked salmon eggs benedict hits all the right notes, especially when it's supported by Baker & Cook's freshly baked bread. Cons: Besides the eggs benedicts dishes, many of the other cooked dishes are lacking in presentation, value, and taste (especially the simple scrambled eggs and sausages). Address: (Two locations) 77 Hillcrest Road, Greenwood or 38A Martin Road. 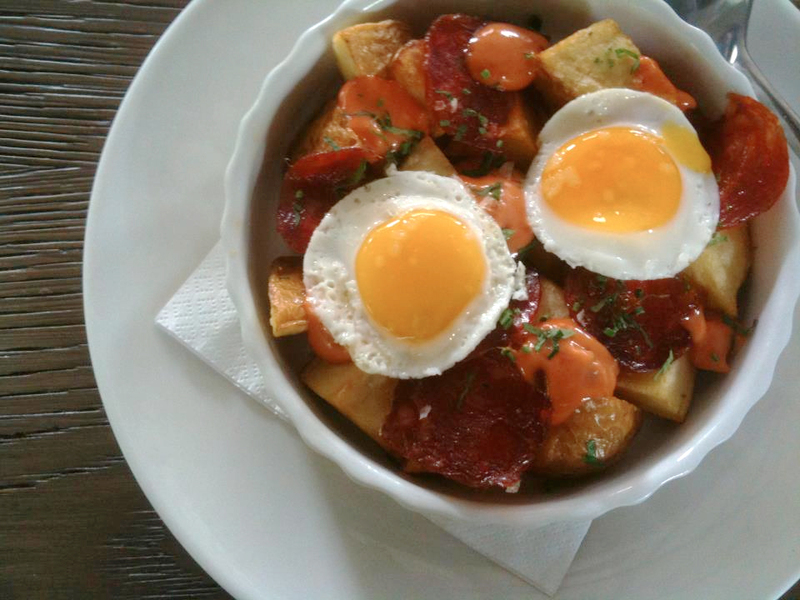 Pros: Presentation and composition of Halia's brunch dishes are lovely, including the eggs benedict. The atmosphere is quaint and grand all at the same time with the elegant colonial surroundings of Raffles Hotel. Cons: The menu at Halia at Botanical Gardens and Halia at Raffles Hotel are completely different (created by different chefs). I personally prefer Raffles Hotel's menu by far. 1. I didn't think it deserved to be there. 2. It slipped my mind! Remind me, please. 3. I didn't have the time/stomach space/cash to check it out yet. If you think a place deserves to be considered, please message me or leave a comment below.